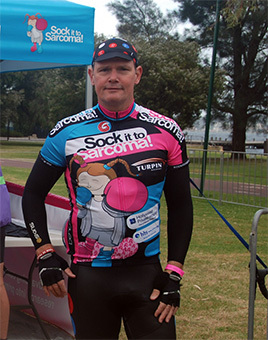 The Ride is a major contributor to Sock it to Sarcoma!’s mission to raise funds for sarcoma research. We ask all Riders to commit to raising much needed funds for the Foundation in order to take part. All donations over $2.00 towards the Ride & Stride for Sarcoma! are tax deductible and will be allocated towards sarcoma research. The fundraising requirement is $750 for the 100km ride and $500 for the 50km ride. However, please don’t stop at that and feel free to raise as much as you can!!! Refreshments are provided on route for Riders and a sweeper van follows with spare parts or to offer assistance if required. On-site First Aid is staffed by accredited providers, should it be needed. Water bottles and sunscreen will be provided for participants. For those that would like to get to know the route and some of your fellow Riders before the big day, several training rides are held. You will receive information about these and also possible fundraising opportunities following registration. Please add our email info@rideandstrideforsarcoma.org.au to your address book to receive our information and updates about the Ride. Our Ride jerseys are eye-catching, unique and help us to raise awareness. As part of your registration you will be asked to select a shirt size. Sizing charts are provided below to help with this. However, we have sample shirts in the office that can be tried on if you are unsure of your size and where possible we will accommodate a switch of size. This may not be possible with late registrations.